Prior to the Battle of Ruusan, Jedi used lightsabers in a vast array of colors. Afterwards, Jedi relied on more common Ilum Adegan crystals such as blue and green. During his Knight Trials, Mace Windu braved the rock-encrusted world of Hurikane on the orders of his Jedi Master to obtain his lightsaber Adegan crystal. He encountered the planet's natives and, in a moment of panic, unintentionally threw them over a cliff. Realizing his mistake, the young Padawan saved the natives. It was from this mission that Mace Windu was given the rare Adegan crystals as a gift. In the New Jedi Order era, Jedi had a wide array of colors such as orange, yellow, green, blue, purple, and light blue. The synthetic red Adegan crystals favored by the Sith can construct a little bit more powerful blade than blue or green Adegan crystals but are generally not as pure because of their artificial nature and can thus be undesirable as the focus of a lightsaber. The Sith apparently had a large supply of red Adegan crystals and also favored red as a symbol for passion. It was not uncommon for the Sith masters to supply their learners with the synthesized red Adegan crystals. However, Darth Vader, at the beginning of his Sith period, wielded a blue lightsaber, as shown in Revenge of the Sith. Likewise, Exar Kun used a blue double-bladed lightsaber in the Sith War. Sith lightsaber Adegan crystals tend to be red because of Sith Alchemy. When making their own lightsaber Adegan crystals, the materials they use and the way they make them almost always turn out crimson. Though most Sith wield a red lightsaber, the color does not affect their decision to use the lightsaber. For example, if the blade turned yellow when first ignited, it would make no difference to the user. Luke Skywalker constructed his lightsaber using instructions hidden in Obi-Wan Kenobi's abandoned hut on Tatooine. Instead of using natural Adegan crystals however, he synthetically constructed the focusing gems within a compact molecular furnace, also found inside Kenobi's home. While the intense heat of the kiln molded the base materials that Luke had placed inside, he channeled his Force energies through them, which in turn shaped and changed their internal properties. 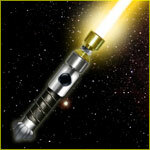 With this way, a completely functional lightsaber Adegan crystal can be constructed. Darth Maul was well-known to have constructed his double-bladed lightsaber in much the same way, but with one major difference. During the forming of the Adegan crystals within the furnace, the Sith focused all of his blinding rage, aggression, and malice into the gems. This leads to the belief that it may be possible to mold the position of the completed Adegan crystal itself through this way. During the first editing of Return of the Jedi, Luke's lightsaber was colored blue in a trailer. 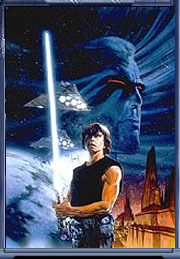 However against the desert blue sky environment, the decision was made to change it to green for a better visual effect, hence the birth of the green lightsaber. It has later been reckoned to be the color of a "Jedi Consular", a Jedi who focuses on mastery of the Force rather than lightsaber combat.